The social record of Asian immigrants has come in for careful study in recent years, but their cultural history has been overlooked. To stir interest in the neglected background of Asian American artistry is one purpose of With New Eyes: Toward an Asian American Art History in the West at San Francisco State University. With New Eyes challenges the assumption that because the lives of many immigrants were so difficult, creativity played no part in them. Here we see a photograph of young prisoners lolling against barbed wire, made by Toyo Miyatake with a makeshift camera he assembled with a smuggled lens. The documentary power of Miyatake’s image pales beside the emotional force of paintings such as Sadayuki Uno’s “Guard Tower” (1944) and Henry Sugimoto’s “When Can We Go Home?” (1943). How Asian memory and art tradition interacted with the currents of realism and European modernism astir in the American West is a fascinating area of study opened up by With New Eyes. 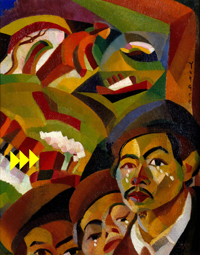 Sometimes the interplay of sensibilities is strained, as in Yun Gee‘s cubist-influenced “Where Is My Mother?” (1926-27). Sometimes it redoubles their power, as in Chee Chin Cheung Lee’s “Woman Sewing” (1932), which gives a Chinese seamstress the towering presence of an allegorical figure by Diego Rivera. A distinctive strain of Asian American pictorialist photography is one of the show’s most important discoveries. The only known print by Los Angeles photographer K. Asaishi, for example, is a soft-focus shot of standing books that creates the kind of prismatic space we see in Lyonel Feininger’s paintings. Should any visitor leave With New Eyes thinking that dilemmas of Asian immigration to America are a thing of the past, to correct that view there is Asia/America: Identities in Contemporary Asian American Art at the Center for the Arts , Yerba Buena Gardens. Like With New Eyes, Asia/America is partly a study of the difficulties that artists of Asian background have in trying to translate their experience using idioms of modern Western art. Masami Teraoka represents one resolution of this problem. His masterly watercolors reinvent the aesthetics of 19th century Japanese color woodblock prints, comically twisting them into commentaries on cultural dissonance. Jin Soo Kim exemplifies another sort of resolution. She registers her shock at the wastefulness of Western culture in found-object sculptures such as the one that enshrines a threadbare upholstered chair inside a cage of rusted wire grid. Baochi Zhang, Ken Chu and Manuel Ocampo are other standouts here. On six monitors, their screens reflected in a trough of water, Hung shows a color videotape of a train journey through the countryside of Taiwan. The images themselves travel horizontally across the six monitors, with a slight lag, which re-creates the impression of looking out a row of railroad car windows. Over time, “On the Way Home” stirs the paradoxical feeling that the longer the journey continues, the further recedes the possibility of returning “home” or even of grasping its meaning. — Asia/America: Identities in Contemporary Asian-American Art – Center for the Arts, 701 Mission Street. Through December 10. (415) 978-2710. — With New Eyes: Toward an Asian American Art History in the West – Art Department Gallery, New Arts and Industry Building, S.F. State University, 1600 Holloway Avenue. Noon to 4 p.m. Monday-Saturday. Through October 26. (415) 338-6535.